He fed our fish, who are normally picky eaters, and they devoured it. They even looked at us as if to say "where's the rest?" My wife and I are amazed at our neighbors fish. 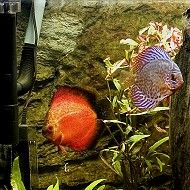 Freindly and active, these fish are beautiful. He feeds only "Aaron's Pet" food. My puffers like it. They seem to be more happy now. Wow, i've never seen my fish looking and acting so healthy. Whatever you did works. Thanks alot Aaron.